by Lara Vetter, Maryland Institute for Technology in the Humanities, Summer 2003; Jarom McDonald, Maryland Institute for Technology in the Humanities, January 2005; Sean Daugherty, University of Maryland Libraries, November 2006, March 2007, and July 2007; Tanya Clement, Digital Cultures and Creativity, University of Maryland and Susan Schreibman, Digital Humanities Observatory, June 2010; and Roman Bleier and Joshua D. Savage, An Foras Feasa at the Maynooth University Institute for the Humanities, 2015. The Versioning Machine (VM) is a software tool designed by literary scholars, programmers, and web designers at several institutions, including An Foras Feasa at the Maynooth University Institute for the Humanities, the Digital Humanities Observatory (DHO), the Maryland Institute for Technology in the Humanities (MITH), and the Office of Digital Collections and Research (DCR) at University of Maryland Libraries. The VM not only provides for elements traditionally found in codex-based critical editions, such as annotation and introductory material, but it also takes advantage of opportunities of electronic publishing. Features include providing a frame to compare diplomatic versions of witnesses side by side, allowing for images of the witness to be viewed alongside the diplomatic edition, inclusion of audio versions of a text, and providing users with an enhanced typology of notes. The Versioning Machine 1.0 was launched at the 2002 ALLC/ACH (Association for Literary and Linguistic Computing/Association for Computers and the Humanities) Conference in Tubingen, Germany, July 2002. Version 4.0 was released June 2010, with Version 5.0 following in 2015. The VM supports display of XML texts encoded according to the P5 Guidelines of the Text Encoding Initiative (TEI). To display texts in the VM, you must use the TEI’s “critical apparatus tagset” (TEI.textcrit, see TEI documentation) to encode all witnesses one XML file. Because the critical apparatus tagset offers the most efficient and thorough methodology for inscribing variants in a structured, machine-readable format, choosing this method can be more complicated in terms of markup but rewards the editor in efficiency in encoding. Because using the critical apparatus tagset is at first challenging, instructions to augment the TEI Guidelines are provided below. To install VM 5.0 locally, fill out the registration form on the VM website to download the zip file that contains a directory that can be installed on any hard drive. Once downloaded, use an unzipping program like WinZip to extract all files in the archive. The contents should unzip into a folder entitled v-machine. To view a description of the product, documentation, and samples, open the file v-machine/index.html in a supported web browser. To uninstall the VM, simply remove the folder v-machine from your hard drive. The VM 5.0 XSLT stylesheet does support browser display. Although initial testing of the VM 5.0 showed that the XML files displayed correctly in Firefox and Chrome, you may want to transform the XML to HTML manually using an XSLT processor. You can perform this transformation in oXygen by applying the transformation scenario. Once the browser window opens with the HTML displayed in versions, save the file as a .html document. The interface for VM 5.0 is designed to be as intuitive as possible. However, there are a few new features that bear mentioning. Encoded textual notes (see Encoding Notes) appear in-line by default, where they can be viewed by hovering the mouse pointer over the letters indicating the notes’ locations. These in-line notes can be toggled off by opening the Notes Panel, which moves notes into a separate window and removes the links from within the witnesses. This can make for a cleaner viewing experience. New in version 5.0 is the ability to change the size and location of panels, allowing you to rearrange the workspace to your liking. The workspace is always at least as large as the browser window. However, as additional witnesses are opened, the size of the workspace dynamically increases to accommodate the possibility of displaying all witnesses side-by-side. The total horizontal scrollable space is therefore determined by the total number of witnesses that are opened. The total vertical scrollable space is determined by the length of the longest open witness. The following sections outline many of the fundamental elements of TEI encoding employed within the VM. The VM supports the display of many TEI header tags. Header information is displayed in the Bibliographic Information pop-up window in the VM, with information from headers for individual files listed sequentially and separated by horizontal rules in the order encoded. Note that since the VM will display all of the header information for every witness in the Bibliographic Information pop-up, you will want to customize information in the <listWit> as much as possible so that users can distinguish between the various versions. For example, rather than titling the three versions of Emily Dickinson’s poem “There Are Two Ripenings,” we included within the <listWit> information that pertains to each source in order to distinguish them. Thus, one version is entitled “A 456: A poem sent to unknown recipient,” another is “A Tr60a: A poem sent by Mabel Loomis Todd to Kate Anthon,” and still another “H 47: Fascicle 14.” When the user scrolls through the information regarding each witness, it is clear which information pertains to each version. As mentioned previously, to use the VM one must use the Critical Apparatus tagset (Chapter 12), specifically the encoding method associated with Parallel Segmentation (section 12.2.3). For detailed instructions in the TEI Guidelines see TEI P5 Guidelines and Index of Tutorials for more information on basic and advanced TEI encoding. Included in the VM download is a set of documents for styling (vmachine.xsl, vmachine.js, vmachine.css). To edit these default styles, see the CUSTOMIZING THE VM section. Because VM 5.0 is designed to aid editors creating editions with multiple witnesses, the VM supports special styling of certain TEI core tags that are used frequently when dealing with manuscript and typescript drafts, <add> and <del>. Each <add> will display in green, courier-font typeface; each <del> will display in red typeface with a strikethrough. In addition, VM supports special styling on transcriptional choices represented by the <choice> element. The intricacies of these elements are described in section 11.3.1 in the TEI Guidelines. In brief, these elements display in the VM by displaying the original word underlined with a dashed line. 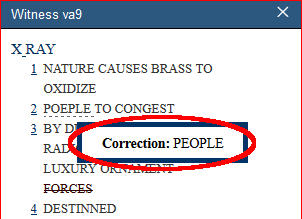 Mousing over this line shows users a second word that is available for this point in the text. The second word appears in a floating box. 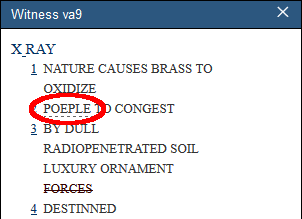 In the following example from “Xray” by Elsa von Freytag-Loringhoven, she incorrectly spells the word “People” as “Poeple.” This misspelling is encoded in <choice> to show the alternate spelling as follows. Additionally, the VM supports <space/> (one of the elements of the TEI.transcr, the tagset for transcription of primary sources). By default only horizontal spacing is supported, and nonbreaking spaces will be added to the transcription. To use <space/> set a the @unit attribute on the on the element to char, and then a number in the @quantity attribute that represents the desired number of nonbreaking spaces. Another supported tag is <unclear/>, an element used to express uncertainty about a word or section in the text due to illegibility of the source (see the TEI guidelines). A text encoded with <unclear/> will by default be displayed in grey. The VM displays information in <note> in Bibliographic Information (if the tag occurs in the <teiHeader>) or as user-manipulated pop-up notes, marked by icons within the text itself. The default display for the <note> within the <text> is a small superscript N; however, if you wish to customize the icon display, you may draw from a short list of VM note types. By using the <note> attribute @type, you can alter the icon display to indicate what type of note is presented. b A <note type=”biographical”> pertains to biographical information. p A <note type=”physical”> pertains to notes regarding the physical object of the page itself. g A <note type=”gloss”> pertains to a gloss or definition of a word or phrase. c A <note type=”critical”> or <note type=”contextual”> pertains to references to critical, contextual, or secondary material information. n All other notes, with or without a @type attribute. The same support of note typology is available to notes in the header. Notes from the header will display on the Bibliographic Information pop-up, preceded by the appropriate label (e.g., biographical, gloss, etc.). Please note the <note type=”image”> in your document is reserved for image data only and will not be displayed (see section on Encoding Images) and notes in <note type=”critIntro”> will display on the Critical Introduction pop-up. To create this pop-up, simply include a <note type=”critIntro”> inside <notesStmt> within the <fileDesc> element in the <teiHeader>. The representation of images is optional. If you wish to display image facsimiles with your texts, however, the VM enables that functionality. The VM image viewer will support the following image types: jpeg, gif, and png. Images larger than 600 pixels high and 600 pixels wide will be scaled to that size for display purposes. If you are using the vmachine.xsl styling, your images should be encoded within <graphic>. The value of @url contains the path to the image while the @xml:id value is a unique id for the image. The <graphic> element is placed within <facsimile>, which is placed after the closing </teiHeader> element and before the opening <text> element. There is a second option available for encoding references to images to be used by the VM. References to images can be tagged within a <note> with attribute @type with the value of image (i.e., <note type=”image”>). The best place to encode this is in the header’s <notesStmt>; if you wish to encode this somewhere other than the <notesStmt>, you will still need to follow the instructions below in regard to the contents of <note type=”image”>. A new feature of VM5 is the support of audio and text alignment. This new feature allows for sections of a transcription of an audio recording to be linked to the corresponding sections of the audio track. Like image encoding, audio encoding is optional and can be made available for one or several transcriptions. The VM audio player supports the .mp3 and .ogg format, and we suggest that files in both formats be available and encoded in order to ensure the best cross-browser support. The audio tracks need to be encoded within the TEI <front> as a list of <witDetail>. The <witDetail> tag needs two attributes, @wit and @target. Both should contain a reference to a witness recorded in <listWit> (as described in the section Recording a List of Witnesses). Within the <witDetail> element, references to the audio files are encoded using <media>. On the <media> tag, the @mimeType attribute must contain the information about the type and subtype of the encoded media, and must also match the available audio files (either “audio/mp3” or “audio/ogg”). Additionally, the attribute @url is required, and its value should be the file path of the relevant audio file(s). Individual sections of a transcription can be aligned with the audio recording using <timeline>. As suggested by the TEI guidelines (16.5.2 Placing Synchronous Events in Time), the <timeline> element is used to provide a temporal alignment of the audio and the text. The first <timeline> element in the sequence must include an @xml:id attribute containing a unique identifier, an @origin attribute with a reference to the first <when> child element, and a @unit attribute. The value of @unit should be the character ‘s’, meaning ‘seconds’. All following <timeline> tags of the same sequence/audio track contain only a @unit attribute with the value ‘s’ (see example below). The first <timeline> element contains two <when> element children. All following <timeline> elements contain only one <when> element each. The <when> tag indicates points in time, and all <when> elements need an @xml:id with a unique identifier, a @since attribute with a reference to a previous point in time (except for the first <when> element), and an @interval attribute indicating the amount of time in seconds. A transcription of the section of the audio recording can than be encoded in the same <app> element. This transcription should match the section of the audio as specified with the <when> element and its @interval and @since attributes. Our second big scene was to take place the day after my marijuana debauch. On the Gulf of … Siam, in the town of Waheen, in what was supposed to be the Hotel Phnom Penh. Now my job was my I was supposed to be a character who got a little drunk and was leaking information to Sidney Schanberg, played by Sam Waterston. The Text Encoding Initiative (TEI) makes available a set of tags referred to as the “critical apparatus tagset” (TEI.textcrit) designed to provide editors with a structured method of recording differences or variations between multiple witnesses of the same text. Using this tagset allows an editor to encode multiple versions of a text in a single document. VM 5.0 is able to reconstruct multiple witnesses from the single XML-encoded document and display them, side-by-side, as individual documents. The critical apparatus tagset supports three different types of encoding variation: location-referenced, double-end-point, and parallel-segmentation; however, only parallel-segmentation and internal location-referenced encoding are supported in VM 5.0. The advantages of using these encoding methodologies are twofold. First, it eliminates time-consuming repetition in data entry; and second, it allows for support of all of the VM’s features. The disadvantage of using these methods is the difficulty of the powerful, but rather unwieldy, critical apparatus tagging. Because of the complex nature of this type of tagging, step-by-step basic instructions on its use are provided here to supplement the TEI’s documentation. If you are already familiar with using parallel segmentation and location-referenced encoding, you may not need to read all of this section, but skimming it may be helpful as it contains important information about how the VM interacts with certain strategies of tagging. Note also sections on Recording Variant Encoding Methodology (<variantEncoding/>) and Recording a List of Witnesses (<listWit>), as these two tags are required by the VM. Read also the section on Encoding Images if you wish to utilize the VM’s image functionality, and the section on Encoding Audio for audio functionality. The VM utilizes <listWit> tagging to produce multiple versions, so your document must contain a <listWit>; TEI recommends that this be added to the front matter. If you do not already have front matter in your document, enter a <front> within <text> and before <body>. Within <front>, enter a <listWit>. This is where you will record bibliographic or descriptive information pertaining to each witness and assign each witness a unique identifier. VM uses this information to reconstruct the multiple versions, and it will display the descriptions on the Bibliographic Info page so that users will be able to identify individual witnesses. The @xml:id attribute on each <witness> assigns an abbreviation unique to that witness. You may devise your own system of naming witnesses (as is the case in the example above), or you may wish to borrow from some recognized catalogue or authority if one exists. When recording variations within the text, the value entered in the @xml:id attribute will identify the text from which each variation derives; this value will appear at the top of the panel in which that version is displayed. identifies the version by whatever bibliographic or descriptive data is appropriate; this prose statement will display in the Bibliographic Info window alongside its unique identifier so that users can ascertain the identity of each version, as illustrated below. The @xml:id value may contain any alphanumeric string. The prose description for each <witness> may be as long or as short as you like. The ordering of the individual <witness>es within the <listWit> corresponds to the ordering of versions in the VM display. Parallel-segmentation embeds variants inline and does not privilege one witness over another structurally; the other two methods require a base text with variants from other versions attached via various linking mechanisms. A basic introduction to encoding with TEI’s parallel segmentation for use in the VM follows; users are advised to consult Chapter 12: Critical Apparatus of the TEI guidelines for more information about critical apparatus tagging. The TEI critical apparatus tagging utilizes the apparatus tag (<app>), within which multiple readings (<rdg>) can be encoded. Entering an <app> into the text signifies that multiple variations are present and will be encoded at that point; each individual variant constitutes a unique <rdg>. Both methods clearly show which variant belongs to which witness. In the first method, the line is repeated intact for each version. In the second method, the line tag (<l>) directly holds only those parts of the line that are common to both variants; the critical apparatus tagging is inserted only where the actual variation occurs. The VM is able to reconstruct versions from either method. The latter method, however, is recommended, particularly in prose, for two reasons: first, it avoids needless repetition; and second, it tags the exact point of variation, so readers do not have to locate for themselves the variant part of the line. That said, if the encoding is particularly complicated, you may wish to use the first method. Note, however, that text can be highlighted by direct clicking only if it is enclosed in an <app> tag. Textual lines can always be highlighted by clicking on the line numbers, but sections of text cannot be clicked on without <app&rt; tags in place. Note that the @wit attribute is required by the VM, which will not display a reading that does not have a @wit value. Just as in the previous example, variants are tagged with <app> and <rdg> at the point of variation and identified through the <rdg> @wit attribute. However, when considering three witnesses, two witnesses may agree but diverge from the third. While it is valid to enter three <rdg>s for each <app>, it is not necessary. To avoid repetition of the same information, you may enter two values within the @wit attribute to denote that those two witnesses agree. Except for the initial word of the line, witnesses A and B disagree with witness C entirely. So following “I,” which they all share in common, an apparatus is inserted to distinguish witnesses A and B from witness C. Witnesses A and B, however, contain one variant word (“dog” or “rhinoceros”); thus, within the first level of apparatus, there is a second level inserted (after “saw a,” which they have in common, and before “today,” which they share) to encode this variant. As you can see, the tagging can get quite complex. But because the <add> and <del> tags are present in just one witness, we need to separate this witness from the rest; by doing so, we can take advantage of VM’s rendering of the <add> and <del> tags. Let’s consider another Macgreevy poem, “Autumn, 1922.” There are four drafts and a published version, most of which have different titles. 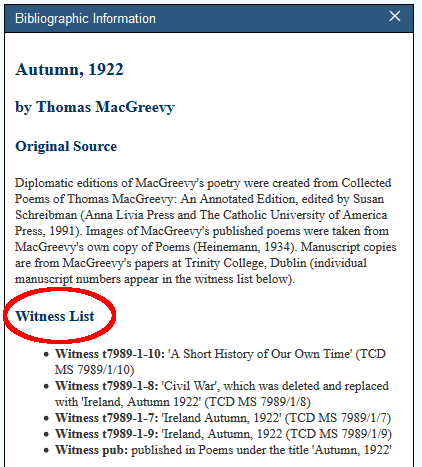 The title of version t7989-1-10 is “A Short History of Our Own Times”; the second (t7989-1-8) has the title “CIVIL WAR” crossed out with “Ireland, Autumn 1922” written in to take its place; the third (t-7979-1-7) and fourth (t7989-1-9) bear the title “IRELAND, AUTUMN, 1922”; and the published version (pub) is entitled “AUTUMN, 1922” but the word “IRELAND” is written in before it. This is simple enough, as it uses principles explored in the previous poem as well. However, “Autumn, 1922” presents at least three challenges not present in our earlier example: (1) one witness contains a third line that is omitted in the other witnesses; (2) one witness comprises one stanza, while the others comprise two; and (3) one witness splits into two lines what appears as one line in the other witnesses. The third method is described below in “Using Location-Referenced Encoding”. Parallel segmentation does not require a base text, and structurally it does not privilege one witness over another; it does, however, allow for a base text. Should you wish to denote that one text be considered the base text from which other versions vary, you would encode those variations contained in the base text as the lemma (<lem>) instead of as a reading <rdg>. Moreover, you might use the <lem> to single out one version from the rest, whether or not it should be considered a base text. Note, however, that VM 5.0 will not display the <lem> any differently from the <rdg> without modifying the XSLT. Location-referenced encoding is primarily useful when witnesses change across different lines in the text. If, for example, in version #t7989-1-10, the first line reads “I saw a dog”, and this line appears in version three in the tenth line, location-referenced encoding allows you to note the similarity between these two blocks of text, and the VM will display this relationship. Using location-referenced encoding is a matter of using the same value for the @loc attribute within each <app> that contains corresponding text. In the following example, from “Xray” by Freytag-Loringhoven, text within the different <app loc=”a7a”> blocks and text within <app loc=”a9b”> will display as parallel text in the VM even though they do not appear in the same line. The VM has the ability to display line numbers encoded into the TEI document. When available, they are activated by default. They can be toggled on and off by clicking on the “Line Numbers” button in the VM interface. The <witDetail> records notes pertaining only to a specific witness (or witnesses); it contains the functionality of the <note> but is customized to treat witnesses. Like a <note>, a <witDetail> can occur almost anywhere within the document header or text. Because <witDetail> requires a @target attribute for linking, it is typically used to refer to one particular <rdg> and is preceded by a hashtag (#). The <witDetail> contains two required attributes, @wit and @target. 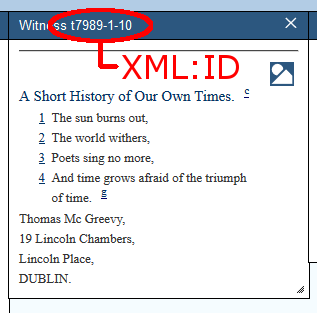 just as in the text encoding examples above, the @wit attribute records the @xml:id value (or values) corresponding to the appropriate witness (or witnesses). Thus, to return to our MacGreevy example, a <witDetail> with a @wit value of “#pub” would contain information pertaining only to the published version of the poem, but not to the manuscript versions. Likewise, a <witDetail> with a @wit value of “#t7989-1-10 #pub” would contain information pertaining to one of the manuscripts and the published version, but not to the other two manuscripts. Open your XML file in the editing window. From the menu bar, select Document>Transformation>Apply Transformation Scenario. Your HTML document will open in your browser window. Save this document as a Web Archive in the folder entitled samples. Open the HTML file in your browser. vmachine.css, the cascading stylesheet file that defines features of display. settings.xsl, which has been included to facilitate customisation of the Versioning Machine. This is explained in more detail below. The schema folder contains both an ODD file and an RELAX-NG schema file. The vm-images folder contains images associated with the VM’s user interface display. The images folder contains images associated with the site surrounding the VM. Please note that most image files are not included in the VM5.0 download package for intellectual property reasons. The includes folder contains the cascading stylesheet for the site surrounding the VM. The samples folder contains sample encoded files that are included for demonstration purposes. The samples folder also contains an images subdirectory that holds JPEGs of some of the sample encoded files. High-level customisation of the VM can now be accomplished through editing of the settings.xsl file in the src folder. This file is intended to allow users to change elements such as the .css file being used by the VM and the logos and icons displayed. This is useful if for branding a particular instance of the VM with your own logo. Editing this file also allows you to change the appearance of the VM when it opens, such as which panels are initially displayed. Finally, the settings.xsl file can be used to point the VM to customized .css or .js files. Detailed information about the settings.xsl file is included in the internal comments in the file itself. Colours of the main or pop-up note backgrounds, text, or links, as well as the styling of <add>, <del>, and other elements used for transcription of primary sources, are handled with a cascading stylesheet located within the src directory: vmachine.css. You may edit it if you wish to alter any of the default choices or add special rendering to particular tags. Elements used in transcription are tagged post-transformation with a font tag that assigns an appropriate class attribute (e.g., <span class=”sic”>); you may alter the stylesheet to specify special rendering of the various classes. If you want to use your own schema, you should place it in the src folder. While the VM does not require a unique schema, it will not work unless your documents are (1) well-formed and (2) conform to TEI’s parallel segmentation tagging as laid out above. Since the XSL file is based in the tags and hierarchies of a TEI-conformant schema with critical apparatus tagset, the VM will not work with other kinds of schemas. Thus, if you wish to use your own schema, we strongly recommend that it be a TEI-conformant schema that incorporates the critical apparatus tagset.